WINNING PITCHER - Pearland pitcher Natalie Trajillo got the win against the Atascocita Lady Eagles in the second game of their best-of-three series. Atascocita won the first game 2-1 and the Lady Oilers took the second game 5-3 forcing a game three showdown. The Lady Eagles won the deciding contest 11-5 to end the season for the Lady O's. 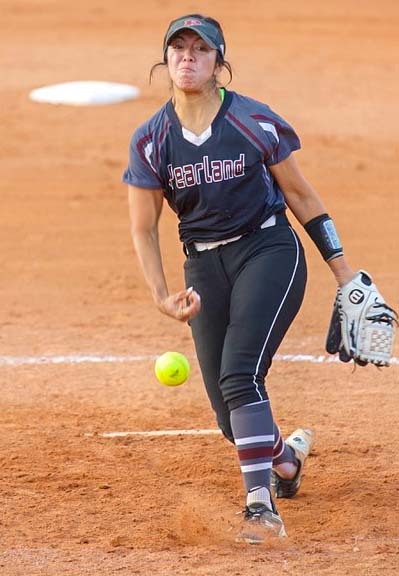 PEARLAND — Pearland faced Atascocita in the area round of the Class 6A Region III softball playoffs in a best-of-three series and came up on the short end as the Lady Eagles took the third and final game 11-5 to eliminate the Lady O's from the post-season. Atascocita edged Pearland 2-1 in the first game of the series forcing the Lady Oilers to win Game 2 which they did 5-3 setting up the third and deciding contest. In a 2-1 loss to Atascocita in game one, Pearland out-hit Atascocita, 5-4, but could only score a seventh-inning run after the Lady Eagles scored twice in the third inning. Pearland won Game 2 with a 12-hit attack, scoring two runs in the first inning and three in the fifth to pull away to the win or go home showdown. Lady Oiler catcher Lauren Ochoa had three hits and drove in three runs in the victory. Pearland pitcher Natalie Trujillo was solid in the circle, working all seven innings while allowing just five hits to pick up the 5-3 victory. In Game 3, Pearland outhit the Lady Eagles 12-10, but weren't able to cash in the runs they needed to win the series. Atascocita scored three runs in the bottom of the first for a 3-0 early lead. They added two more in the fifth frame to up the lead to 5-0 before Pearland finally got on the scoreboard in the sixth with a pair of runs to cut the lead to 5-2. The Lady Eagles put the game out of reach as they exploded for six runs in their half of the sixth to move in front 11-2. Pearland wasn't going to give up as they scored three runs in the seventh to close the gap to 11-5, but it was too little, too late as the game came to an end sending Atascocita to the next round. Pearland's Ashlin Moreno had three hits and drove in two runs, shortstop Janna Roberts also had three hits, and centerfielder Rylie Love drove in two runs. The Lady Oilers close out the 2018 season with a 22-16 mark.